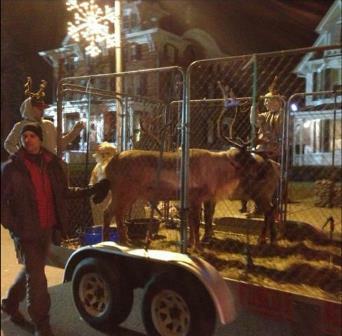 For those of you coming to our Open House this Saturday, here’s a sneak peak at Santa’s live reindeer who also had the opportunity to participate in the annual Hunterdon Holiday Parade on December 1, 2013. The parade was presented by the Hunterdon County Chamber of Commerce. I had the pleasure of assisting Mark Sopko, owner of Reindeer Magic and Miracles, with the float showcasing his special friends, Rocket and Fetch. Dr. Joe Martins, DVM, walks along with Reindeer Float. 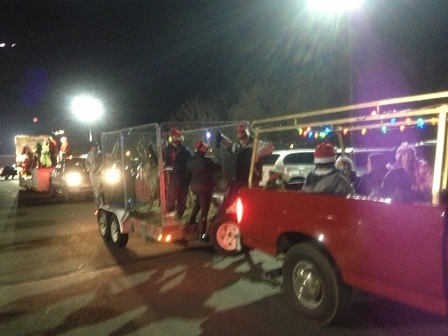 The live reindeer are favorites at the annual parade. If you missed the parade, you won’t want to miss your photo opportunity with them this Saturday, December 7, at our Open House at Belle Mead Animal Hospital. Bring your camera. We have also arranged professional photographer Raj Iyer to be on hand in our reception area. He will be available to take holiday photos of you and your leashed pets for more lasting memories of the occasion. You can learn more about Mark and his live reindeer on his website, Reindeer Magic and Miracles. Our Open House is available to anyone and will take place from 1–4 p.m. Find more details in our Blog post here. 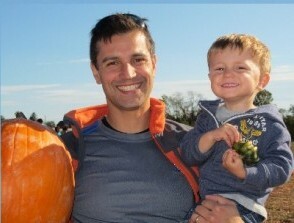 RSVPs are encouraged by calling the hospital at 908-874-4447. We hope to see you there! This entry was posted in Events, News, Veterinary Services and tagged Pet Health, Pet Wellness, Veterinary Medicine, Veterinary Services. Bookmark the permalink.